Changing the world. One step at a time. - Become a happy activist! Changing the world. One step at a time. At Love Not Waste, we want to show you & surprise you that more can be made from plastic waste. See below for a short summary of our projects. Wanna start something, let's get in touch! Change the world, start local. Love Not Waste started the Green Challenge series! Local entrepreneurs are presented in a relay race to motivate other entrepreneurs to start operating more sustainable. They explain how they make their daily practice more sustainable and show the diversity of a greener operation. Choosing cleaner energy, recycle waste streams, buy local produced products or sell fair trade made items. All participants proof that Green & Business definitely go together! Get inspired by their stories and start your own! Read more! In Spring 2017 I joined the awesome team of Plastic Whale on a secret mission to develop design office furniture made out of the plastic they collect during their daily plastic fishing events. We brought together a project group for the first brainstorm sessions at Design Thinking Center Amsterdam. Lama Design worked on the product designs and VEPA furniture made it real by bringing in the necessary production techniques followed by prototyping. The full product line was launched the 22nd of February 2018. Read more! Love Not Waste wanted to turn something out of the waste we found. So we could inspire beach cleaners on the spot that they are actually hunting raw material in stead of waste. We were inspired by Dave Hakkens Precious Plastic Machines, but wanted something simple, light weight and easy to build & carry. 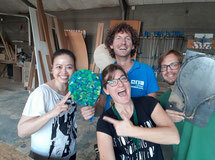 So we turned to the engineers and marketeers of the Amsterdam-based company Bugaboo and brought together a group of enthusiasts, old household electronics and a beach cart to bring to live Recky, the recycling racket machine! Read more! Did you know you can build a complete store out of waste materials? A professional retail environment, that looks like a million bucks but doesn't cost a thing? Check out the 3 basic principles of the Love Not Waste concept store design. If you want to see more circular materials and techniques in full action, get inspired at ABN AMRO Bank's new office initiative Circl. The green future is now. Check our showcase of cool sustainable brands, I Am Plastic, that are already being produced of plastic waste. G-star Raw for the Oceans creates this awesome shirt from plastics recovered from the oceans. See many more beautiful products!